No matter your route—whether you’re traveling from Boston to New York, from D.C. to Philadelphia or from Los Angeles to Las Vegas—you’ll want to find a great deal on Megabus tickets. Megabus operates in 34 states, as well as in Ontario, Canada, providing plenty of options all over the country. But of course, some of those routes are more popular than others. So, how can you find a deal? If you’ve taken a trip with Megabus before, then perhaps you’ve heard about the elusive Megabus promo code. Like unicorns and good airport food, most travelers believe Megabus promos are a myth, a fiction, an old wive’s tale. Do such coupons really exist? Are they even worth searching for? 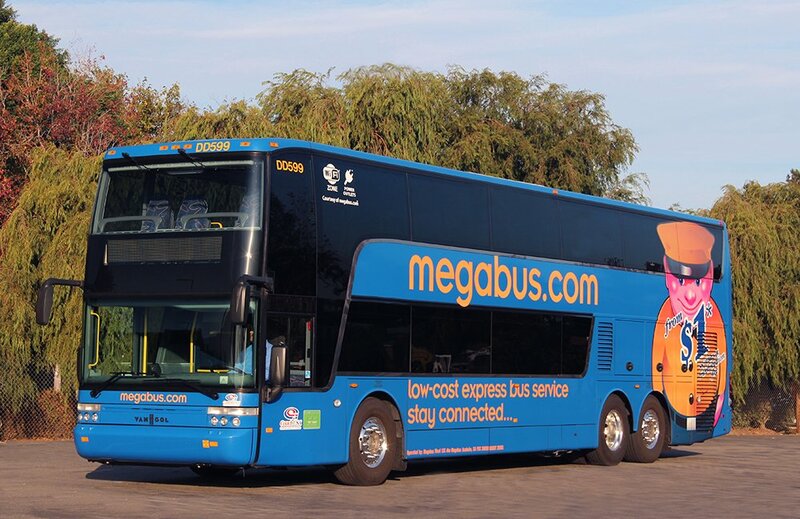 Well, we come bearing good news: Indeed, Megabus promo codes are real! In fact, you can find cheap bus tickets quite easily—all it takes is little bit of digging. Below, find our guide for how to find the cheapest Megabus tickets across the internet. Before we begin, let’s talk about the kind of deals that are available to you. Below, we’ve listed 20 of the most popular Megabus routes in the entire U.S., along with the lowest price we’ve found for that particular route and the cheapest day on which to travel. *Lowest price for a one-way Megabus trip on this route found on Wanderu within the last 30 days. **Best day to travel to score cheap Megabus tickets. Many of these promo codes are only made available after making a purchase from a Megabus partner. That said, you don’t have to purchase an item in person to get access to a Megabus promo code: The majority of these discount codes are made available to you after an online purchase. For other discounts, such as the Megabus UNiDAYS program for students, you can sign up directly on the Megabus website. Whatever the promo code is for, it will cut down the overall cost of your trip, making for a more relaxed and budget-friendly vacation. Travelers taking the due diligence to scavenge the web for a deal are hoping to find the elusive $1 bus fares. These super-cheap tickets can be found on the Megabus website, or on platforms such as Wanderu that allow you to compare prices for bus tickets from different carriers. Even so, there is some strategy involved in making sure you find and secure those dollar tickets. While prices that cheap can appear often on the Wanderu and Megabus websites, they rarely last long. 1. Book 2-4 weeks in advance, or earlier. The absolute best way to find a $1 bus ticket is by booking early. According to Megabus “Reservation Terms and Conditions”: “While ticket prices start at $1.00 on all trips, megabus.com typically only sells a very limited number of $1.00 tickets per trip to the first or initial customers that purchase a ticket for that trip.” Therefore, you want to get among the first to purchase before the bus starts filling up. 2. Have flexible arrival and departure dates. If you book on a slower day of the week, you’re likely to get a better deal. For Megabus, the popularity of a route has a significant impact on the price. This means that the busier a schedule the more expensive the tickets, and the less busy a schedule the cheaper the tickets. Schedules on less-popular days will thus have more $1 tickets available. Regional routes tend to be shorter in duration. The shorter your trip, the more likely you’ll be to find a $1 ticket for that route. That’s because regional routes tend to have more trips per day. More buses departing per day means more seats to fill. 4. Book tickets, even if you’re unsure. As your departure date draws closer, the price of a bus ticket is likely to rise. Even if you’re unsure whether a trip is actually happening, or aren’t sure what time you want to leave, you might as well book a $1 ticket if it’s available. Worst case scenario: You don’t end up going and you’re only out a dollar. But in being proactive, you’ve potentially saved yourself big money by booking ahead. And if you want to get out of town and don’t necessarily care where, consider using the Wanderu Explore tool. Simply plug in your hometown, a date, and select a price tier (such as under $10). Wanderu will spin up cheap results that will fit your timeline and budget. If you’ve found a Megabus promo code, it’s incredibly easy to use online. First, go to Wanderu.com and select the Megabus trip that works for you. After clicking “Book” and confirming your seat selection, you’ll see a section on the checkout form under “Booking Fee” that says “Add Redemption Code.” Clicking that link will prompt a box to pop up where you can enter the coupon code. Why Does Megabus Offer $1 Tickets? You might say to yourself, How can Megabus afford to offer these unbelievably cheap prices? It seems like they’d lose money. Well, $1 deals are a great way for Megabus to encourage passengers to travel to their favorite destinations and try out their bus services. If the experience is positive (which they hope it will be), you’ll be more likely to travel with Megabus again. Furthermore, Megabus uses a dynamic pricing system called “yield management” to respond to consumer demand. That means when a bus is more full, the tickets will be more expensive. But when the bus is on the emptier side, prices will be cheaper. The objective then with selling $1 tickets is to fill those empty seats, which are especially common during off-peak travel times. And that is when you’re most likely to save a buck. Are Megabus Promo Codes Available for All Routes? Since the price of a route varies based on the date you book and popularity, finding a Megabus promo code for those incredibly busy routes can be challenging. Booking a day ahead of time on a Sunday evening bus during a peak travel weekend isn’t going to be cheap—and it’s very unlikely that you’ll find a Megabus promo code to help. When Is the Best Time to Find a Megabus Deal? Megabus deals are easiest to find when few tickets have been booked on the bus. To take advantage of this, book as far in advance as possible. For example, say you’re unsure of what weekend to travel in May, but you want to plan ahead to make sure you get that good price. If it’s January, why not take the plunge and buy tickets for two different weekends? Chances are they’ll both be dirt cheap and the money you lose will be negligible compared to what you’d pay later on. By booking far out, you’re ensuring that the fares are at their cheapest possible price. By the time your plans are set in stone, the tickets may be super expensive or altogether unavailable. Combined with buying in advance, booking off-peak times is the other key to buying $1 Megabus tickets. If you’re able to travel at a less popular time, then you’ll have the opportunity to snag a Megabus promo code. Less-traveled routes are going to fill up slowly, so the $1 Megabus tickets will be available for longer. On the other hand, for popular routes, you can never book too early. Remember that no unique Megabus coupon is required to snag a $1 deal. Megabus $1 tickets are offered on everyday routes and times. One of the most popular times that Megabus offers a promo code to riders is when they open new routes around the country. A good way to keep track of such promotions is to follow Megabus on Twitter, where they regularly post about deals, sales and discounts. Can You Pay Cash for a Megabus Ticket? It’s important to note that all Megabus tickets, including $1 fares, are only offered online. You are not allowed to pay cash to board a Megabus. Purchases are only available on Megabus.com or from a travel-search platform such as Wanderu. While it is possible to buy a bus ticket the same day as your trip, you must do so on the web and bring a copy of your confirmation email in order to board. What Is the Megabus Refund Policy? Unfortunately, once a reservation is booked, Megabus does not allow for cancellations or refunds. However, up to three hours before your scheduled departure time, you can trade your tickets in for a different trip. The cost of your initial booking will become a credit toward your new journey, though you will be asked to pay a trade-in fee of between $3 and $7.50 depending on the time of trade in. The one exception to the refund rule is for situations in which Megabus fails to provide reliable, on-time service for reasons that are completely within their control, in which case a refund may be offered. For any additional questions regarding reservations or booking, you can contact Megabus at the following phone number: 1 (877) 462-6342. One of the primary benefits of searching for bus tickets on Wanderu is that you’re able to find and compare the price of tickets across carriers—not just for Megabus, but for other popular buses such as Greyhound and BoltBus. Whether or not you’re able to secure a slippery Megabus promo code, you’ll be able to take a trip for an affordable price. Cheap tickets to New York and other cities all across the country are available right this second, especially if you purchase in advance. Now is the perfect time to plan a fun weekend getaway or a wonderful week-long vacation.